The Pittsburgh Catholic College, Pittsburgh, PA, circa 1878. Had it not been for the faith and hard work of a German-born Catholic priest, industrial Pittsburgh might have waited decades longer to secure a permanent Catholic college. By the 1870s, all across Pennsylvania the Jesuits, Augustinians, Franciscans the Christian Brothers, and other teaching orders had established new Catholic colleges to serve the burgeoning urban immigrant population. In Pittsburgh, however, early efforts to secure a Catholic institution of higher learning floundered, that is until Fr. Joseph Strub and the Congregation of the Holy Ghost came along. Pittsburgh Catholic College Luminaries, Pittsburgh, PA, 1888. 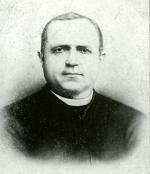 Reverend Joseph Strub, founder of the Pittsburgh Catholic College, 1878. As the history of Duquesne University illustrates, the rise of Catholic colleges in Pennsylvania and elsewhere was tied directly to the growing urban industrial economy and the waves of immigrants attracted by the promise of economic security and family stability. 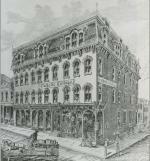 First chartered as a Catholic academy in 1878, the Pittsburgh Catholic College of the Holy Ghost was incorporated four years later. The name reflected the institution's urban Catholic identity, and the central role Fr. Strub's congregation played in the school's administration. For the first few years, classes were offered in rented space above a commercial bakery on Wylie Avenue. Only later did the school purchase property atop Boyd's Hill, overlooking industrial Pittsburgh. Interior of the Duquesne University college chapel, Pittsburgh, PA, circa 1960. Language in the original charter made clear the college existed to provide an education "in all branches of a thorough moral and secular education, including languages, the liberal arts and sciences." This included philosophy, theology, and for some, preparation for the priesthood. Through its program of classical studies and character development the college sought to preserve the Catholic faith even as it offered greater access to mainstream American opportunities. Not surprisingly, the priestly founders' motivation was to serve the local Catholic students who had matriculated through the parochial school system. While the first priests, and many of the first students, were of immigrant German background, over time a strong Irish element surfaced in the administration and student body. By the early twentieth century, a growing number of students of Italian and eastern European ancestry found their way to campus. Duquesne University campus, Pittsburgh, PA, circa 2004. 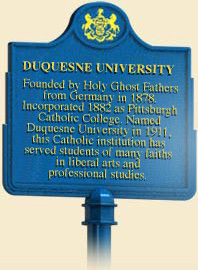 In 1911, the college changed its name to Duquesne University of the Holy Ghost. When the state legislature appropriated $50,000 to the school in 1919, some taxpayers filed suit, objecting that the state constitution prohibited expenditures to denominational institutions under the control of a church board. Two years later the Supreme Court of Pennsylvania ruled in favor of the plaintiffs, affirming the separation of church and state when it came to direct funding. In 1935, the university charter was amended to remove the words "of the Holy Ghost." Despite this name change, and governance by an independent board of trustees, the university remained fixed to the Congregation of the Holy Spirit (the Spiritans), as the order is now known. Like many institutions of higher education, Duquesne and its urban campus evolved with the surrounding neighborhoods and the city. So too did the curriculum. In 1913, the university replaced references in the charter to preparing young men for the priesthood with a broader mission that came to include professional programs in business, law, pharmacy, nursing, and the health sciences. Augustinian College of Villanova, Villanova, PA, 1890. For Duquesne and other Catholic colleges and universities there had always been a delicate balance struck between the faith-based and modern, progressive educational theory. The challenge was to remain faithful to the tradition while incorporating new programs that prepared students to make their way in the world. Duquesne's modern urban campus blends the old with the new, just as the institution sponsors innovative academic programs informed by a strong Catholic liberal arts education. "Spiritus est qui vivifact"–"It is the Spirit which gives life"–reads the school motto. Home to a diverse population of more than 4,000 students drawn from around the world, Duquesne has faced many of the social and economic problems that plague urban campuses. In 2006, five members of the men's varsity basketball team were shot following a dance party on campus. In many respects the institution embodies Pennsylvania's urban, Catholic, and often immigrant educational experience. Joseph F. Rishel and Paul DeMilio, ‘The Spirit That Gives Life": The History of Duquesne University (Pittsburgh: Duquesne University Press), 1997.